Tina Tchen speaks onstage during the 30th Anniversary Celebrating Women Breakfast at Marriott Marquis Hotel on May 11, 2017 in New York City. The former chief of staff for former First Lady Michelle Obama will head The Recording Academy's new task force focused on inclusion and diversity. 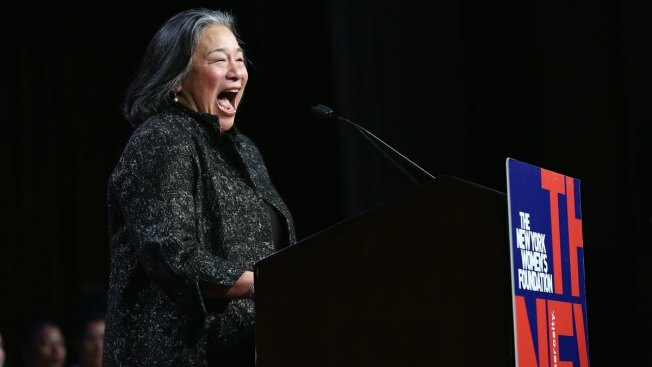 The academy announced Tuesday that Tina Tchen (chen), a veteran lawyer who is also working on the Time's Up Legal Defense Fund, will chair the new initiative. The Grammys announced the task force after its CEO drew criticism for saying women need to "step up" when asked about the lack of female winners backstage at its 60th awards show, held in January. The task force plans to uncover unconscious biases and other barriers that impede women's success in the music industry. Tchen says in a statement it's "an important initial step by the Recording Academy to demonstrate its commitment to tackling these challenges in a comprehensive way." A 2-year-old girl's reaction to former first lady Michelle Obama's portrait is warming hearts all over the world.